Union Budget 2017-18 was announced by finance minister Arun Jaitley today. This time budget was a special event as it was released post demonetization. Many of us were expecting tax relief, inflation control, infrastructure development and much more from budget 2017. Up to some extent, this demand was addressed in budget 2017. 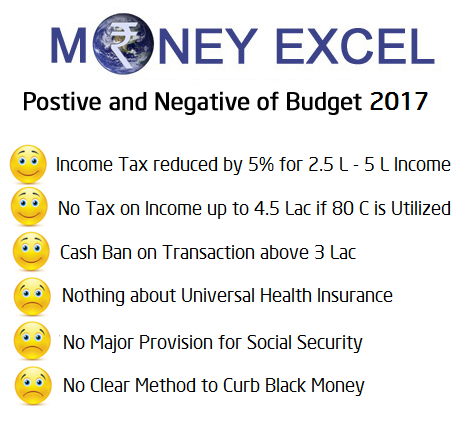 Overall Union Budget 2017 seems to be OK. A lot of new announcements were made by the finance minister in budget 2017-18. Let’s Review Union Budget 2017-18 & its impact on you in detail. It was expected that tax exemption limit will be enhanced from 2 Lakh to 5 Lakh. However, this limit is not modified. One minor modification was done in tax slab. Tax rate of lowest income slab is slashed to 5% from 10%. Now onwards tax rate applicable for the income in the range of 2.5 Lakh to 5 Lakh will be 5%. For senior citizens (age above 60 years but less than 80 years) the tax rate for the income range 3 Lakh to 5 Lakh is reduced to 5%. Surcharge is introduced from income level above 50 Lakh. If income level is above 50 Lakh but below 1 Cr surcharge of 10% is applicable. On Income level above 1 Cr surcharge of 15% is applicable. Income tax 80 C investment limit remains unchanged 1.5 Lakh. No tax payable on income up to 4.5 lakh if 80 C is fully utilized. New proposed Income Tax slab for FY 2017-18 (AY 2018-19) is given below. Based on new proposed tax rate you will able to save additional Rs. 10,000 to Rs. 12875. Income tax return form will be simplified and new one pager form will be introduced for the income group less than 5 Lakh without any business income. This step will surely boost Income tax filing from individuals. Holding period of immovable property for long term capital gain tax is reduced to 2 years from existing 3 years. This is to boost property transactions. To curb black money and to boost digital transactions new law is introduced about cash transaction. One cannot do cash transaction above 3 Lakh. However, nothing is mention about consequences of not following this rule. The base year of Indexation is proposed to be shifted from 1.4.1981 to 1.4.2001 for all classes of assets including immovable property. No service tax applicable for booking e-ticket from IRCTC website on Internet. Aadhar Pay, a merchant version of Aadhar Enabled Payment System, will be introduced. Maximum amount of cash donation, a political party can receive from an individual is limited to Rs.2000. What is your take on budget 2017? Basic,easy and quick overview of budget.